Saraswati Vidya Mandir College of Education (SVMCE), Rohtak was established under the management of Uday Bharti Education Society. The aim of the college is to impart proper training to the educated youth in the field of education and also to enable the prospective teacher to understand the nature, purpose and spirit of Secondary/Higher Secondary Education. The college is approved by National Council for Teacher Education (NCTE).The college conducts undergraduate level programme in teacher’s training. The college has well experienced teachers to enlighten the aspiring teachers. 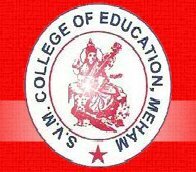 S V M College of Education, Meham offers various graduate courses as well as Post Graduate courses. S V M College of Education, Meham is affiliated to Maharshi Dayanand University, Rohtak. List of facilities available at S V M College of Education, Meham for students.